I hate to make assumptions and say you haven't played these games, but I find it to be the case that people often haven't. There were quite a few good games for N64 so a few were bound to get lost in the mix. These are just some of the ones that I played that I don't hear getting talked about very much. If you've already played them all, good for you, you win the prize. The ghosts sometimes dress for the stage. 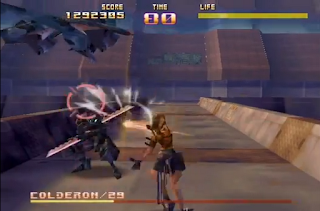 This was one of the few games I owned and played for Playstation but it was also out for Nintendo 64. I hardly remember it, but I know that I spent a good deal of time on it and that there always seemed to be another level to unlock that required me to go back and find more stuff in previous levels. That might sound like a pain, but that was the sort of thing I liked and it offered a good deal of replay value. 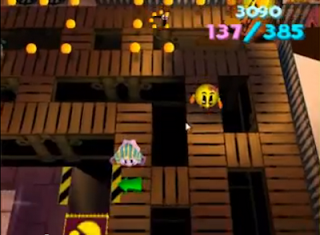 The levels basically consisted of classic Pac-Man style mazes with dots and ghosts, where you had to get a certain number of dots to get to the next area; and also segments with block-pushing puzzles and other obstacles. The things you needed to go back for were additional stars awarded for collecting all the dots, finding all the fruit, getting a high enough score, and finishing under a certain time. These levels weren't short either, and I remember spending a considerable amount of time exploring each one in search of fruit and dots. This game is probably one of the most unique games you'll ever play. Your character is a microchip and your setting is a space station filled with robot animals. Your goal varies by stage, but involves skill and puzzle solving as you take control of the robot animals and use their varied abilities to access new areas and deactivate (kill) the other animals so you can take control of them when you need them. You are the little black thing floating between the sheep and dog. There is a wide variety of animals to control, including farting rats, hyenas that attack with contagious laughter, and a polar bear on treads which drops poo-shaped mines and launches cannon balls from its nose. It's always fun when you manage to fell one of these mighty beasts and use it for yourself, but there are also times when you must abandon the lumbering tanks for an agile mouse to get into a small space or a defenseless sheep so you can glide across chasms. 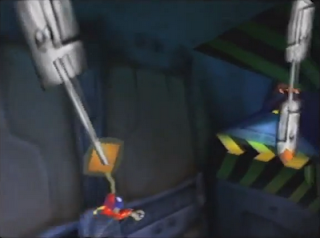 It gets fairly challenging too; in fact, I guarantee that you can't beat it because there's a glitch that prevents it. Unfortunately, as great as this game is, there is a game-breaking glitch that prevents you from playing the final level. Still, the game is definitely worth playing. Don't you wish Star Fox 64 had a sequel for N64? Well, it pretty much does in the form of Sin and Punishment. This game was only released in Japan but is now available on Wii Virtual Console and it's well worth checking out (along with its sequel, also for Wii). It plays a lot like Star Fox, except you move your character independently from the aiming reticle, so you have to pay attention to both not getting hit and to where you're shooting. There's a lot to shoot too, so building combos and destroying groups of enemies in one shot in pursuit of a high score is an added layer of depth. Also, you'll need to keep a lookout for larger incoming projectiles which you can bat back at enemies with your sword. It's epic, frantic, and quite difficult, but it's very fun. Even though it's a Japanese game, the cutscenes are voice acted in English with Japanese subtitles. Of course, the story doesn't make any freaking sense, but at least it feels epic. Admittedly, the graphics are pretty crappy, but once you're playing it you'll hardly notice. Fans of Star Fox or arcade-style shooters definitely should check this one out. This is another unique game and it's by Rare in their prime, so that ought to tell you something. The gist of this game is that there's a truck stuck going on a designated path with a nuke on it and if it hits anything, it explodes. 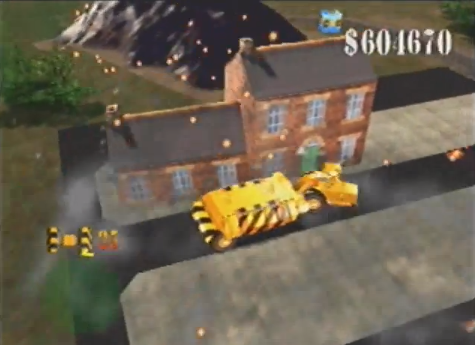 Of course, the only logical thing to do in a scenario like this is to destroy all the buildings and obstacles in the way, so that's exactly what you do. You do this by using a variety of vehicles which range from bulldozers to flying robots and destroy all the buildings that would get in the truck's way. The buildings can be destroyed in chunks too so it's pretty satisfying to watch them fall apart in pieces. That in itself is fun, but for completionists, each level also has little lights to find and turn on, an award for destroying every building (proving the plot was just a half-formed excuse for destruction), an award for finding all the survivors, and sometimes hidden satellite dishes that unlock new levels and challenges. Exploring the levels for every little thing was probably my favorite part, especially since that included destroying every little thing as well. If you do well enough, you can even continue your destruction on the moon. On a console with lots of great adventure games like Super Mario 64, Banjo-Kazooie, and Donkey Kong 64, it's hard to play them all. But Rocket: Robot on Wheels holds its own with the best of them. Like other games from its genre, Rocket has you collecting various objects in order to open up the next area so that you can find more of those objects. The main hub is located in an amusement park and each level is similarly unique, not just recycling the usual fire level, water level, forest level formula. It's filled with clever ideas that require exploration, puzzle solving, and platforming and it's fun throughout. In particular, I recall a part where you build and ride a roller coaster and another part where you have to dip yourself in paint in a certain order to disguise yourself. What did I miss? Let me know in the comments! I know Bomberman: Second Attack was one I always wanted to play but couldn't find, so perhaps that also belongs on this list as well.